Time to prepare for next year! It’s a beautiful moment when your backyard birds — like these Black-capped Chickadees — depart their nestboxes. By October, it’s time for one last duty as nestbox landlord: to clean it out. Cleaning will reduce the incidence of parasites in the box and make it more inviting to next spring’s tenants. It will also help you know for sure if it gets used again. Watch a video about how to clean a nestbox in Related Resources below. Support for BirdNote comes from Bloomsbury - a publisher of natural history books and birding guides. “Critical Critters” by Ralph Steadman and Ceri Levy is available now. But by October, it’s time for one last duty: to clean it out. Some experts* recommend removing old nests into a plastic bag for disposal. Use gloves and a dust mask to avoid exposure to any avian diseases. Use a stiff brush or scraping tool to further clean the interior. Some people opt to disinfect the box with hot soapy water or even a mild bleach solution. 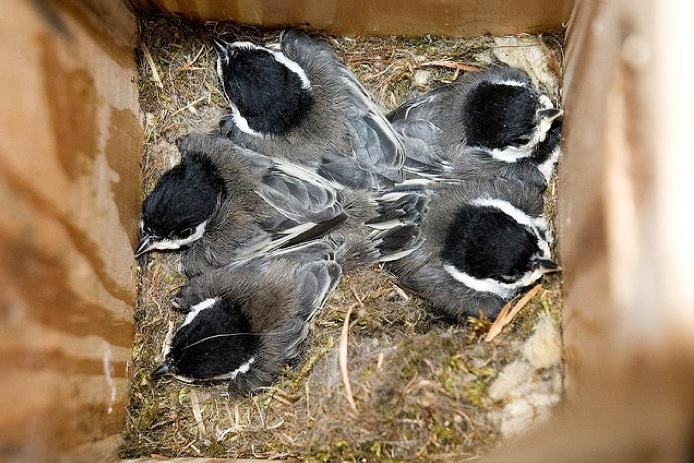 See a video about how to clean a nestbox when you come to our website birdnote.org.